Sean Yates was a hard man of old school pro-cycling. Coming from the British based scene, Yates made that very difficult route from domestic amateur to full time continental pro. In a long and distinguished career, he became the third British person to wear the yellow jersey and a time trial stage in the Tour de France and Vuelta Espagne. After retiring as a pro, Sean continued to race on the domestic scene and also moved into management – from the chaotic McCartney team to the brave new world of Team Sky. Some points from reading the book. It is revealing into the mindset and attitude that Yates’ had to life and cycling. You get an overwhelming impression that this is a guy willing and able to repeatedly drive himself into the ground. Although there’s no firm link, you do wonder the extent to which his health problems are related to the intensity he was willing to put into riding the bike. As you might expect, Yates just avoids the whole issue of doping. I don’t think it’s mentioned even once. He’s loyal to Lance Armstrong and in the best traditions of the old school omerta leaves the drug issue well alone. Personally, I feel rather detached from this. I’m so full of doping confessions, doping reports, doping books e.t.c. I didn’t expect Yates to have anything revelatory to say. It is kind of the elephant in the room, but that’s Yates and the era of pro cycling. On the plus side you feel you are reading quite an open and honest account. There isn’t really a side to Yates, he does tell it like he is. Another good feature of the book is simply the fact that Yates has been at the heart of procycling for the past 30 years. He may have been mostly a domestique, but he was racing alongside the greats of the era from Stephen Roche, Sean Kelly and Robert Millar. I particularly liked the insights into Robert Millar. One chapter is written by his ex-wife. I thought that was a good touch and offered an interesting insight from another perspective. Only it did reinforce Yates’ image as a bit of a lad. It was perhaps fitting that Sean Yates was director sportive for Team Sky when Bradley Wiggins was the first British person to win the Tour de France. But, you don’t particularly come away with an overwhelming sense of achievement and pride. The thing that sticks in your mind (perhaps unfairly) is the petty dispute between Wiggins and Froome. Wiggins wanting to leave the race, whilst wearing yellow because he felt Froome stabbed him in the back by attacking on one stage. Yates said it took Dave Brailsford to persuade Wiggins to stay in the race. I received the book as a free review copy, and enjoyed dipping in. It’s not particularly inspirational, but you have to admire certain qualities of Sean Yates – the tremendous determination, talent and commitment. 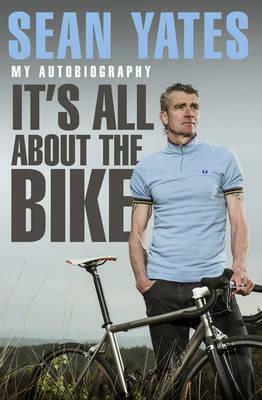 In a way reading the book made me glad I didn’t become a pro cyclist. Sean Yates is the real deal. The classic hard man from that era of pro-cycling. I started reading this book and wanted to put it down because as you mentioned the doping elephant in the room was present in my mind. I just decided to park the doping issue and read it, occasionally it entered my head but I carried on regardless. I think what comes across is Seans love of just riding his bike and thats what inspiration I took from it.